I have done the head bob a record number of times in the last two weeks as my body has been begging for more sleep. I’m practically a bobble head on the dashboard of a moving car. Everything in my life has been full on and sleep is the first to suffer. Work has ramped up, training has – well no – training is just always ramped up, and for some reason, I thought maybe I could ramp up my social life too. And suddenly I look around and I have no clean clothes, dishes piled to the ceiling, unpaid bills, permanent footprints in my bathtub and cob webs forming on my couch. I feel like I’ve only sat down to pee, put on my shoes, work and sleep. I am exhausted and lately I’ve been feeling like my performance is going downhill and that I’m never going to be ready for race day. I know that now is not the time for self-doubt but it crept in like a disease and it’s been hard to shake. I’ve been craving a break to let my body rest, but coach has other plans in mind and well the guy is like the rain man of triathlon training so I can’t argue, but I did ask for an extra day off this past weekend. He seemed slightly shocked that I wanted to skimp on workouts during the final three weeks of prep, and I suppose I understood considering I wanted to take the day off to drink beer and play in a ball tournament instead of riding my bicycle for four hours. Irregardless, he took my four workouts from Saturday and Sunday, combined them into one, said to have fun and in not so many words to never ask for an extra day off for fun ever again. I arrived in Revelstoke on Friday night and swore off the beer for the first night so that I could get up at 6am for the double duty workout. 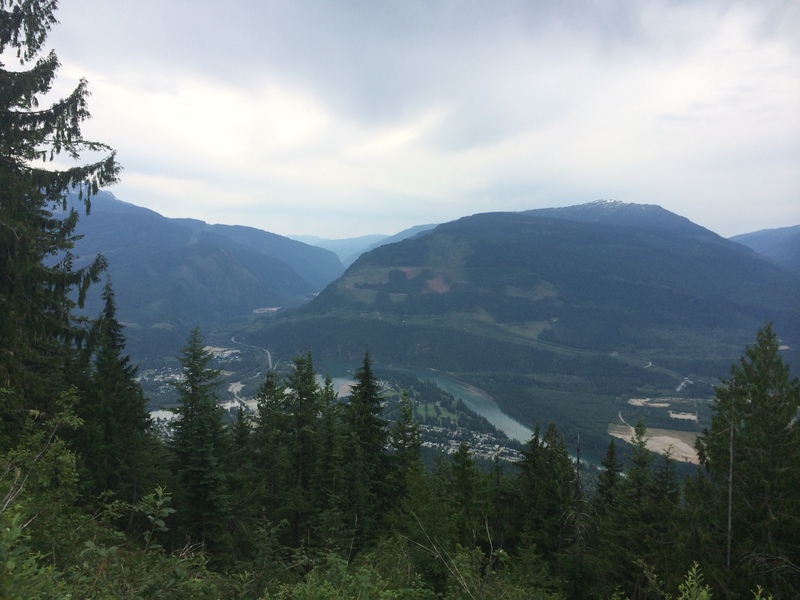 First on the docket was a 45 minute warm up on the bike followed by a ride up the Steamer – a 25 kilometre, 1,500 metre climb up Mount Revelstoke. In my mind I had prepared myself for a legs burning, lungs dying cycle and I was amped to just get ‘er done. As I flew down the highway and came up under the overpass I saw the ascent ahead of me and prepared to endure the pain. Yet within only a few hundred metres I realized that this would be one peaceful and beautiful challenge. Huge trees loomed around me, while the odd squirrel, rabbit and deer would pop out from the shrubs to curiously watch me spin along the pavement. I could hear the vast sounds of nature with mini roaring waterfalls and soaring birds. This is one of the first rides in a long time where my skin wasn’t being scorched by heat and with the calmness of the world around me, I settled in for one of the tougher, yet ironically relaxing climbs of the season. As I reached the top and looked out over the valley I breathed a sigh of relief and content, before peeling around and tucking in for a fast descent. The fresh breeze whipped at my face and I felt strong and oddly rejuvenated. The self doubt was fading and I was back on top of the world. Once back into town I threw the bike in the car, put on the running shoes and set off for a 10k tempo run. Much to my surprise there was a fire in my legs that wasn’t burning or painful, but lively. I was raring to go and everything felt rhythmic and smooth. I had no pain in my shins, and my heart rate remained at a constant, manageable beat. After a brief warm up I kicked it up and took off for the tempo, maintaining an even pace the whole way. I haven’t felt that strong on a run in forever, and after dominating the Steamer, I was amazed that my legs had it in them to deliver that kind of performance. Rounding back into town, I looked down at my watch to see a personal best for a 10K effort and a smile spread widely across my face – I almost wanted to hug myself. Instead, I tossed off the tri gear, grabbed my ball glove and a celebratory beer and ran out onto the field for a game of softball with my buddies. I deserved my extra day off and was going to enjoy every minute of it before going back to reality and the grind. This sport can be so draining and with the physical ailments comes the mental wavering until you eat away at yourself. Some days are incredibly tough and you feel like quitting, and then you hit a PR and suddenly you feel on top of the world. I’m learning to trust in myself, believe in myself, and to not be so hard on myself. Training is so much more than becoming a stronger triathlete, it’s also about becoming a stronger person and learning who you are and what you can do. Some days you just have to hunker down, tell yourself you can do it, and just do it. The Challenge is less than three weeks away, and I am holding onto the positive vibes, strong legs, and tough mind for as long as possible because that’s exactly what will carry me across that start line right to the finish.